Food Wishes Video Recipes: They’re Bigger, They’re Better, and They’re Back! They’re Bigger, They’re Better, and They’re Back! This 60-Second Brussels Sprouts recipe just debuted on About.com, and as you may have read, I plan on posting all the video recipes I’m producing for them as soon as they go “live” on their site. I’ve already posted this recipe, shot with the old web cam a while ago, so you may have seen this before. But, I think this brand new version is much better, and the video quality is far superior. As you can see below, the video is larger that the regular YouTube embed. This is a bit of an experiment, as I had to widen the post column to make room for the new recipes. Anyway, I hope you enjoy the new version and the larger flash player. Ok, enough techno babble. These really are delicious Brusses Sprouts…believe it or not. I know you may be thinking “delicious Brussels Sprouts” that’s an oxymoron! No, these really are tasty. As you'll see, the secret is the super fast cooking time. Seriously, this could be your new favorite veggie. Like most people, I hated Brussels Sprouts until I had them prepared in the style you are about to see. 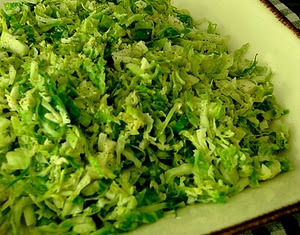 This preparation is so different than any other recipe I’ve seen for these tiny green cabbages. I really hope you’ll give them a try. Enjoy! I may well be in a minority here, but we have slow DSL and this larger version won't play at all, though it will play on the About.com website, but there I have to let the entire thing load first; otherwise, it is too jerky to understand. Sigh. Wow Chef, the new videos look great! I can't wait for more. Keep up the good work. Since these are the property of About.com, this is the only option I have for showing them. I believe there is free software online that lets you download any wed video and then play it on your computer. Maybe our more techie readers can make suggestions. Also, remember this is only for the Aout clips, I will still be making and posting food wishes only clip when I get caught up. Thanks!! For a Chef who claims to be technologically challenged, I'd say, marginallly challenged, at best. You did a great job and the new look is beautiful! So glad the nice folks at About.com allow you to imbed here. Any trick to save time, whether cooking, browsing or otherwise, is more than welcome! love the new video format! You can download the FLV file directly if you dig around in the Net listing of the FireFox plugin "Firebug". It shows all files being downloaded and one comes up when you hit play. Copy and paste that URL. I did it for this video and created a shortcut, but you'll have to do that for any video you want to download to your drive. I made this dish last night for my Mom and others, it was loved by all, excellent way to use this vegetable. did this before when you posted it - liked it then, but kinda forgot about it. I'll have to pick them up at the store on my next trip. As a long-time lover of the sprout, I am always glad when someone else recognizes how wonderful they are. Coat a non-metal non-metal baking dish with cooking spray. Add fresh or thawed, dried sprouts. Drizzle with melted butter, and sprinkle with salt and pepper, to taste. Bake at 450 for about 30 minutes, until the sprouts are crispy on the outside and soft in the inside. They come out very sweet, similar to the result of baking beets! This is a delicious way to prepare sprouts - they're fresh, slightly crisp and the flavour is enhanced by the lemon and butter. My late father, an R.C.A.F. officer in England during W.W.II, loathed sprouts. They were served too often in the Mess - overcooked, waterlogged and a dismal grey in colour. These bright green delicacies would probably have converted him! Very good video. I don't know if you'll even see this comment, but I was a little unclear as to when the 60 seconds started; when you put the sprouts in the pan or after you added the salt and pepper? Wow...is all I can say! I made these with my fresh garden brussels sprouts and the kids were licking the plate!!! As always, THANKS CHEF!! A Celebrity Chef’s Worst Enemy? David Letterman!